Check to turn on sounds for keyboard keys. 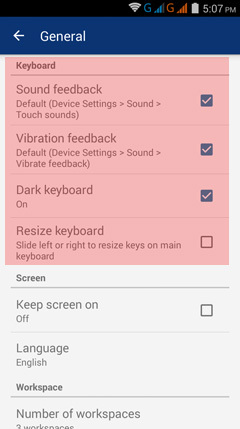 Check to turn on vibrations for keyboard keys. Check to make the keyboard keys a darker color. 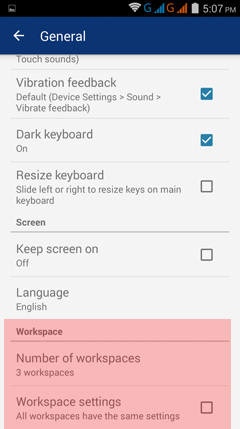 Check this option to be able to resize the keyboard. While in the workspace, slide left to hide the leftmost column (keys π, e, sin, cos, tan). Slide further left to hide the next column (keys deg, n!, /x/, x^n, x, root, log and i). It also makes the other keys larger. Check to prevent the screen from dimming and turning off. Enables the user to select his/her preferred language. Tap to view the different languages. 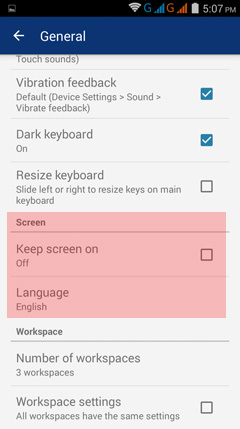 The App's commands are automatically translated into the chosen language. 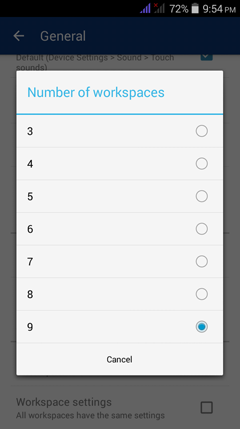 Enables the user to add workspaces from a minimum of 3 to a maximum of 9. Tap to add more workspaces to both your Calculator and Graph windows. Check to keep the same settings for all workspaces or uncheck to assign distinct workspace settings to your Calculator and Graph windows.